A hanging banner sign over your exhibit is the surest way for attracting attention to your brand from anywhere on the trade show floor. Let attendees know where you are! 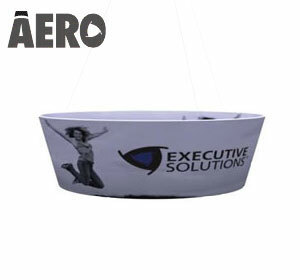 Each Aero™ hanging banner is a top-of-the-line, custom made, tension fabric structure. There are 18 standard shapes available in multiple sizes. Looking for something even more unusual? Custom shapes and sizes can be ordered to to fit almost any marketing need imaginable. We love what we do… and we're proud of our people, our manufacturing and design capability. Check out this Photo Gallery of Recent Aero™ Projects. If you have any questions about choosing the right hanging banner sign for your event needs please call us toll free at 1-855-536-3385 or contact us by email.